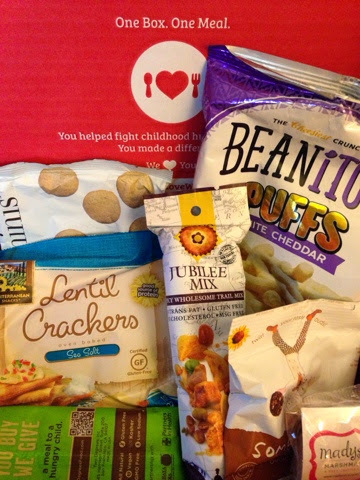 I am so excited that I received my very first Love with Food Box for July. One of the things that initially attracted me to Love With Food is that they offer healthy snack options since I try to eat Gluten-Free as much as possible. Most of the snacks but not all are Gluten-free. They will be coming out with an all Gluten-Free box in August. I get the Tasting box which is $12 dollars a month. I got my box last month for $2 dollars with a coupon code. I believe anyone who signs up new you get your first box for free. You just pay the $2 dollars for shipping. If you do sign up I would appreciate if you used my link but you do not have to. If you use my link I get points to go towards buying food products in the future. I do purchase this box with my own money. Love With Food comes in a nice hefty package. None of my items where crushed or broken upon arrival. I got it in an apple flavor. I actually thought it was pretty good and enjoyed it. However, it was almost to sweet for me. I think I would have preferred a peanut butter flavor. It does make a great snack or breakfast when you are on the go. I actually am a fan of trail mix. I thought I would like these but honestly I could not even finish them. They where just too spicy for me. I actually do like spicy foods but the combination of spices was not for me. In one flavor it tasted like curry. In another flavor it tasted like pepper. I do not like pepper and the curry was too much for my taste buds. I ended up throwing the rest away. I was not sure I would like these since I normally am not a fan of seeds. But, mixed in the chocolate they where surprisingly good. I had also been craving chocolate so that was a nice treat. They are very crunchy as well. I LOVED this. It was my favorite thing in the box. I wish I could have made a smore with it but instead I roasted it. I loved that little bit of chocolate flavoring. It was so good. I am going to be buying more of these for sure. They are Gluten-Free as well but not Vegan. I enjoyed these lentil crackers with the sea salt. I usually only eat chips with sea salt. I thought they where okay. I ate them right out of the bag. However, I think they would have tasted better with some dip. I probably would not purchase these since there is another brand of lentil chips I actually like better. I liked these cookies. They reminded me of shortbread cookies. So, these where a hit with me. I am not much of a cookie eater so I don't know if I would purchase these or not. But, I would like to try more from this brand. I love white cheddar and I love puffs. I have heard of Beanitos but never purchased anything from them before. These are gluten-free but not vegan since they have the cheddar. I really wanted to like these. And I did. But, they where not my favorite. I would not buy these. I didn't hate them but I can't see myself eating these on a regular basis. I just got Beanitos bean chips and I am excited to try those. I hope they are better then the puffs. I did not try these and actually gave them away since I do not have kids. I probably would have tried them but I am really not a big fan of fruit chews so decided to give them to someone else. I am sure people who have kids would enjoy getting something like this in their box. Overall, I was really pleased with my first Love With Food box. I was glad I got to try some of these items before actually going out and buying them. I also found some new brands I want to try more from and had never heard of. I am excited for next month's box and will continue with my subscription. I am going to stick with the tasting box for awhile but if I really enjoy the products I might upgrade to the deluxe box. I also haven't decided but I might switch or add the gluten-free box in the future. Sorry if you left a comment but my blog was not working and it had something to do with this post. so, I had to delete and repost.